As the dusty desert caravans wound their way westward from Persia and Iran, it is supposed that secreted among the rare spices and jewels on the basket-laden camels was an even more precious cargo: A longhair cat. They were called Persian for their "country of origin," but hieroglyphic references as early as 1684 B.C. shroud forever their exact beginnings. 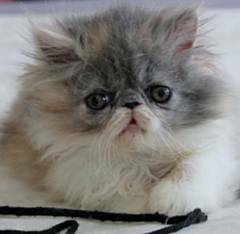 Persians, with their long flowing coats and open pansy-like faces are the number one breed in popularity. Their sweet, gentle, personalities blend into most households once they feel secure in their new environment. Creatures of habit, they are most at home in an atmosphere of security and serenity, but with love and reassurance, can easily adapt to the most boisterous of households. 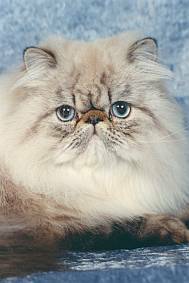 The ideal Persian should present an impression of a heavily boned, well-balanced cat with a sweet expression and soft, round lines. Present standards recognize Solid Persians in nine different color classes: white (in blue-eyed, copper-eyed, and odd-eyed), blue, black, red, peke-faced red (quite rare today), cream, and chocolate and lilac Persians (shown together in the Other Solid Color Class). Keeping the Persian indoors keeps it safe from transmission of disease and parasites, as well as the dangers of urban life. The grooming required to keep a Solid Persian looking beautiful requires a great deal of effort. The long, flowing coat that makes the Persian so glamorous can quickly become a nightmare for an inattentive owner. Perfect grooming cannot be achieved unless the animal is in first-class condition. Appropriate condition can be achieved by providing protected environment, proper diet, daily exercise to encourage muscle development, and freedom from parasites and disease. A daily routine should be established to include cleaning of the face to remove stains and a complete run-through with a metal comb to eliminate tangles. Baths are necessary once a week (or at least every two weeks) to remove excess oils, dead coat and to stimulate new coat growth. It is not necessary to keep temperatures uncomfortably low to encourage coat growth. 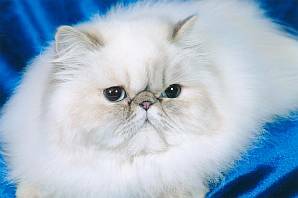 The Persian, when groomed and cared for properly, can live for easily 15 to 20 years.